I haven't had time since I got back from holiday to read every post of every blog that I follow, but I was glad that I caught the post about HFDL in Adam, M6RDP's blog. HFDL stands for High Frequency Data Link. 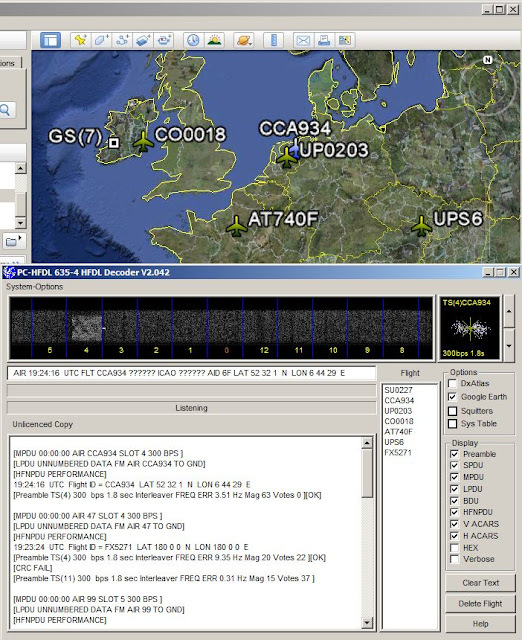 It is also known as HF ACARS, which gives the game away as to what it is about, for ACARS stands for Aircraft Communications Addressing and Reporting System. In other words, it's like APRS but for aircraft. HFDL uses a proprietary protocol. Transmissions use USB with a symbol speed of 1800 baud. The modulation is 2-PSK, 4-PSK or 8-PSK with effective bit rates of 300, 600, 1200 or 1800 bits/sec. Aircraft log on to a ground station, of which there are currently 17 located around the world, each of which receives on several different and unique frequencies. The ground station assigns the aircraft a sequence ID number which is used in subsequent communications with it. HFDL is used by over 1200 aircraft operated by more than 60 airlines and allows pilots to always be able to communicate with the ground, no matter where they are located. I downloaded the PC-HFDL software from the author G4GUO's web page which unfortunately contains no information about the program itself. I also downloaded and installed Google Earth which is used to display the positions of the aircraft. I tuned my receiver to the frequency 6532kHz mentioned by Adam, which is one of the frequencies used by the ground station at Shannon. After a minute or so I received a loud signal that was obviously a burst of quite rapidly modulated data. After a few minutes of head scratching when the program did not decode anything I found that it apparently sets the input level from the sound card to zero at start-up. PC-HFDL is "shareware" and this is presumably one of the annoyances authors of such programs put in to encourage users to pay up. It is more likely to encourage me to uninstall the software, but that's another subject. Once the program is receiving the audio from the radio, each burst results in a decoded message being displayed by the PC-HFDL program, while the aircraft position is plotted on Google Earth. You can see the results of about 10 minutes of listening on the 6532kHz frequency in the screen grab. After 10 minutes or so of receiving the program shuts down, another limitation of using it without purchasing a registration. But 10 minutes is probably enough for most people to realize that, whilst the technology is interesting, as a pastime it would quickly get boring. Perhaps it would be possible to receive signals from more distant aircraft, but that's about it. There's a lot more happening on HF APRS, plus as a licensed amateur you can actively participate. It doesn't appear to be possible to submit position reports from PC-HFDL to a site like flightradar24.com (which I discovered from a comment to Adam's post) which aggregates aircraft positions received by amateur enthusiasts to display a real-time radar map of all the commercial aircraft in Europe. Those position reports are sent using ADS-B (Automatic Dependent Surveillance - Broadcast) which uses a frequency of 978MHz and requires a dedicated receiver costing around £500. Welcome back from your holiday! I missed reading posts from you, OM!